Palpitation(s) is a sudden awareness of one's own heartbeat. This usually occurs as a sensation in the chest of a rapid, irregular, fluttery or unusually strong heartbeat. This sensation can arise from stress such as fear, anxiety and anger. It is also common when using stimulants such as caffeine, while smoking and while taking certain medications such as decongestants. Palpitation is also a symptom of certain medical disorders, particularly those of the heart or the thyroid gland, as well as drug overdose. (see Further Reading below). If additional symptoms such as dizziness, nausea, fainting, sweating, chest pain etc. are noticed consult your physician or contact your local emergency room. In some cases, palpitations may be termed idiopathic, meaning that they have no known cause. This term generally appears on MSDS's as a symptom of exposure. Exposure to certain chemicals is known to cause palpitations. Common examples are refrigerant gases such as Freon 114. As always, read your MSDS's to know if palpitations are a symptom of exposure and take precautions to minimize your exposure. Bear in mind that palpitations have many possible causes, so don't simply assume they result from a workplace exposure. Your doctor or cardiologist can perform a number of different tests to rule out known causes. Heart Palpitations at Temple University Hospital. Heart Palpitations at the NIH's MedLine Plus Encyclopedia. What Causes Palpitations? at the National Heart, Lung, and Blood Institute. 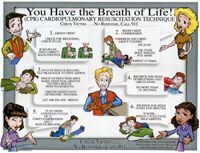 Get your CPR safety wall posters and more at Safety Emporium.